Our Moakes families come from South East London, mainly from Newington, Lambeth, Southwark and Bermondsey. 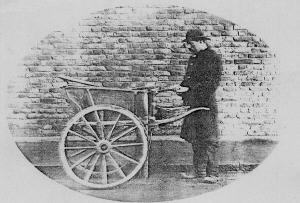 There was another set of Moakes north of the Thames, mainly in Marylebone, but no connection to them can be shown as yet. The earliest definite ancestor is William Moakes who was born ca 1740 and who married Jane Kitchen on 16 September 1764 at St Mary, Lambeth (see parish registers). William was a Thames waterman, apprenticed first to Philip Gough at the age of 16. The profession of waterman usually followed from father to son and was jealously guarded within the families that worked on the Thames. Records of watermen exist from 1692 and William was the first of the family to be recorded so his father was evidently in another trade, perhaps a butcher or a fan-maker? William and Jane had two sons that we know of - William who was born in 1770 and Robert who was born in 1776. William followed his father in career choice and we know of five successive generations who were Thames watermen. Robert, who was my ancestor, chose another line and was both a fan-maker and a butcher and nearly all his descendants were in the butchers trade. Dock life in London and the Thames in the 18th and 19th centuries did not resemble today's docks. This engraving by T.H. 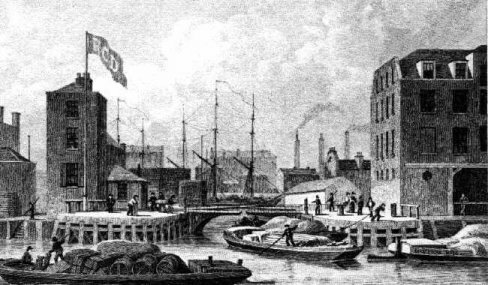 Shepherd in the early 19th century of the entrance to Regents Canal, Limehouse shows typical barges of the time. The lighters did not have sails and were steered only by oars. The lightermen had to have intimate knowledge of the tides and the movement of the water and a considerable amount of skill was needed and this was why an apprenticeship of 10 to 20 years was normal. The lightermen usually ran their own business and were "a sober class of men". "A drunken lighterman, I was told, would hardly be trusted twice." to quote Mayhew from Mayhew's London, published in 1851. 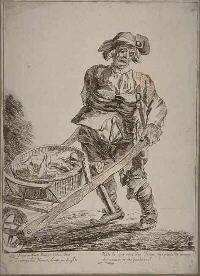 Early illustrations of cats' meat men. "purveyors of horse flesh" or "cats' meat men". 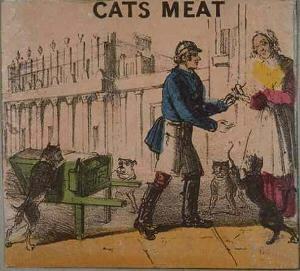 A later example of a cats' meat man in Greenwich, 1885. From 'The Illustrated Police News' for the 26 August 1876. "Cats' meat man attacked by dogs". On friday last week, within a mile or so of Middleton, an itinerant purveyor of meat to dogs and cats, was going his usual rounds, when to his infinite surprise and alarm, a pack of hounds rushed at his barrow and basket he carried, and proceeded to devour the food so ravenously that the poor cat's meat man began to think that he was himself destined to fall a victim to his voracious assailants. Resistance being out of the question he therefore let the animals eat up the dainty viands without attempting to offer any opposition. The keeper of the dogs eventually arrived with a heavy whip and managed to keep them in subjection while he fed them with meat from the barrow. It transpired that the dogs had been a long time without food and the gate of the yard in which they were kept had been accidentally left open, and hence it was that they rushed out and made an onslaught on the cat's meat man.
" Many visitors came to the streets, there were lamp-lighters, muffin men and cats-meat men. The latter carried their wares on long skewers over their shoulders. The smell drew all the strays in the area, canine as well as feline. " Robert Moakes' son James (also a cats' meat man) married Ann Bustin in 1837 and they had fourteen children, one of whom, Cecilia, was my great-grandmother.